Short NASA video examines how the agency derives one of the most utilized temperature data sets – the GISS (Goddard Institute for Space Studies) temperature record. 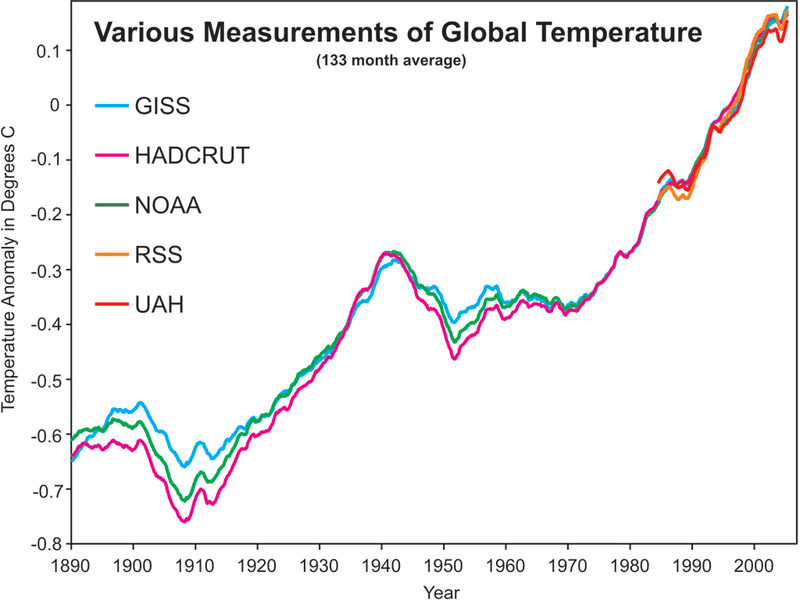 GISS is one of several widely referenced data sets. The other main ones are HADCRUT, (Hadley Climate Research Unit, UK), NCDC (National Climatic Data Center – part of NOAA), and the satellite systems, RSS (Remote Sensing Systems) and UAH(University of Alabama Huntsville). Contrary to what deniers may tell you, all the data, as well as relevant computer code, is available to anyone that wants it. Skeptical Science has a good short primer, and this graphic comparing the various sets. As you can see, there is very little disagreement among the groups.